Never have I ever cried throughout an entire performance, because of an emotional attachment to a main character. And it’s not because I have a crush on an actor! 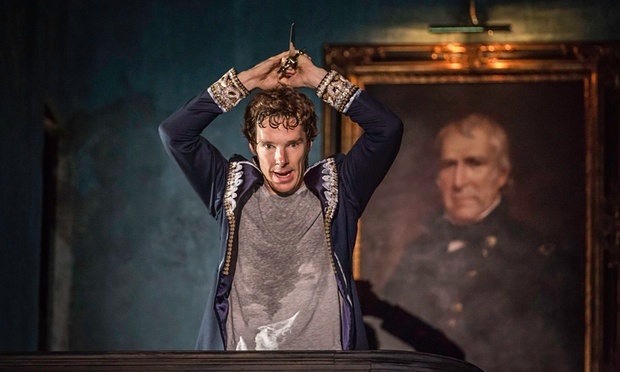 That was, until I saw Hamlet at the Barbican Theatre. I attended the show, with my Drama school, as part of our theatrical understanding of William Shakespeare. Before I went, I heard negative feedback from my peers – not just about Hamlet, but Shakespeare in general, as his writings [according to one] were excluding and difficult to understand. So, I went with high-hopes and I came out of the theatre, still recovering from my tears. Hamlet’s father, the Old King of Denmark has been murdered by his jealous Uncle, Claudius. Not long after his death, Claudius marries Hamlet’s mother and sits upon his throne. Disgust by his Uncle and depressed by his loss, Hamlet then suddenly becomes addicted to revenge. By doing so, he loses everything and everyone he loves – his friends, fiancée, and even his own family. Although the story is timeless, I noticed how Sonia Friedman, the producer of the show cleverly hinted some things about each character and situation in the story. For example, Hamlet playing with his castle and dressing up as soldier. What does it show the audience? Does it represent madness or simply the loss of a Prince’s childhood? They are cleverly delivered and shown in a way that the audience can understand perfectly, if they either have or haven’t seen a Shakespeare play before. The cast delivered a first class performance, especially Benedict Cumberbatch who made me cry for start to end. Even his version of Shakespeare’s famous “To Be or Not to Be” speech had me in floods of tears, as I mouthed the words along with him. Every time he cried, I cried with him. Somehow, Cumberbatch’s performance has taught me that a true actor must express his emotions. And he has done it well. If it must be, I believe Hamlet is Cumberbatch’s finest performance of his career. And finally, I want to give a shout out to Es Devlin for his amazing work on the set. It is one of the finest of theatrical sets that you’ll ever see – it’s like an actual, beautiful dining room in a magnificent palace. The set is cleverly detailed, allowing the audience to understand the stability of the Royal family in the play from start to finish. It was breath-taking and very chilling, at the same time. Overall, I give Hamlet a trillion out of ten. It is a wonderful, creative, well-thought out and emotional performance. I would highly recommend to see and book pretty quickly, because when I saw the show, it was a sold out event. Also, I recommend to bring plenty of tissues and leave them close to you. Today, I went on an outing to the cinema. Earlier in the week, my cousin suggested that we should see William Shakespeare’s Hamlet. Having some information but never seen the play before, I agreed to come. What the audience would normally see is a traditional Shakespearean show, set in the seventeenth century with actors, dressed in Stuart costumes and belting out Shakespeare’s wonderful, yet sometimes confusing, dialogue. However, this wasn’t the case. Indeed, this production of the show, live from the Manchester’s Royal Exchange Theatre did stick to the lines. However, there have been a lot of changes. For instance, the setting for the play is in 21st century Denmark, all the actors have different British accents; Scottish, cockney, etc. The massive difference however is some of the characters are portrayed by women. These include Polonius (renamed as Polonia), Rosencrantz and Hamlet, who is played by the wonderful Maxine Peake. Peake delivered a gripping, intense and funny portrayal of Hamlet. I was hooked into her character; I was unsure if the director and/or producers were trying to show the main character as a young adolescent. If they did, then Peake was right person for the role. As the Prince of Denmark, I could easily see her emotions and feelings, being brought to life on her own and with the cast. Also, I give her top marks for the famous To Be or Not to Be monologue; it was spoken to true perfection. I also give credit for Gillian Bevan and Katie West for their wonderful portrayals’ as Polonia and Ophelia. Both women were equally wonderful. One, who gave out the most comical laughs. The other, who gave me tears when it came to the important bits in the play. They, like Peake, had me on the edge of my seat. One minute, I’ll be laughing, the next crying. I must confess, I had more heart for Ophelia, with all the trouble she had to go through Hamlet’s ordeal. The set is incredible – they had light bulbs, which lit up when the Ghost is contacting Hamlet from the dead and they had a graveyard, full of clothes. They even had Ophelia’s dress (which West wears in the show) buried in the pile, representing the character and had a few jumper’s crafted into skulls. This is genius; you would never expect any of this in a Shakespeare play. The music gives me the chills in my spine. It’s kind of like composing a detective story; you hairs get spiked up and it makes your body freeze, like you are outside on a cold, December evening. They are instrumental pieces done right. Overall, this modern re-telling of Hamlet is excellent. If it comes out in cinemas again or on stage, I would recommend it. Although it’s one of the world’s most filmed story, I guarantee that you’ll never look at Shakespeare’s play the same way again. What Did I Learn From Edward Scissorhands? Yesterday, you may have noticed that I was off WordPress. Well, the reason why I was off was because I went to the theatre last night. I went to see Matthew Bourne’s production of “Edward Scissorhands”. I noticed that “Edward” was originally a film and was directed by Tim Burton in the early 90’s. I haven’t seen the film for myself, yet, so I haven’t been able to compare the two of them. I (one of my friends from my Waiting Fir A Rainbow Series) told me that “Edward” was based on Burton’s own experiences, while he was growing up. Apparently, Burton had struggled to fit in because he was different from other children. It’s these real life events that everyone can relate to, including myself. I came along with me to see “Edward” for the evening and to be honest, the two of us weren’t expecting what would happen next. I never saw the film and he had never been to see a Matthew Bourne production. So, it was something new for the both of us. The last production I went to see by Matthew Bourne was “Swan Lake” and I really enjoyed it. If you are into dance, especially ballet, you may now that the original production involves with women and sticks to the way Tchaikovsky would have originally planned it. However, Bourne changes it into one, as if he had written the story himself. And its spellbinding! From start to finish, you wouldn’t have the nerve to leave your seat, even after the show has finished. What happens next? What happens next? you would ask, little a small child in a cinema. But in most cases, you’ll never know what happens after the ending. “Edward” was no expection; from start to finish, the whole show had us on the edge of our seats, with excitement, happiness and even tears. (I’m not too sure about I, but I certainly had a tear or two in my eye.) Like most dance productions, Bourne uses no words. Instead, he uses emotions and movement to express the situations the characters are in, like sadness, anger and passion. It’s different, compared to Musical Theatre or Plays, but it’s in own right, it leaves the audience wanting more. What I have learned from “Edward” is that you are not alone in the world. Looking at one of its main themes (isolation), the story shows that it’s okay to be different because some people will appreciate you for who you are. And those people may become your closet friends, like Edward and Kim. Friendships may last a lifetime or forever but it takes the right kind of people to bond with you for life. So who cares if you have scissors for hands or you can’t do things that other people do because the one thing you can do is be true to yourself, be kind to others and have courage. They will admire you for your feelings in years to come. If Matthew Bourne’s “Edward Scissorhands” comes into your local town, I strongly recommend you to see it. It is truly amazing and I guarantee that you won’t go home feeling disappointed. Author SezPosted on February 20, 2015 March 29, 2015 Categories Articles, Non-Fiction, Open Discussion, Pure Interests, Theatre, Theatre ReviewsTags Dance, Edward Scissorhands, Matthew Bourne, Theatre, Tim BurtonLeave a comment on What Did I Learn From Edward Scissorhands?